For Megan Tarrolly, June 26 started as an ordinary Tuesday. Mid-morning, her boyfriend, Adam Dixon, called to invite her to dinner that night. He wanted to eat at the Silver Spur, the spot where they’d met and where they planned to go for their third anniversary a few weeks later. Adam told Megan he had a gift certificate, plus it was $5 martini night. The Waukesha couple decided to meet at 7:45. What Adam didn’t mention was that he’d be there 15 minutes early to make sure everything was ready for his proposal. 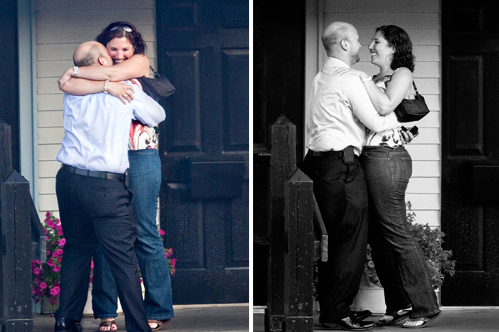 He even arranged for a photographer—Sarah Stevens of “I Do” Photography—to secretly catch the whole thing on camera. As Adam drove to the restaurant, he realized he wouldn’t be able to make the last-minute arrangements he’d hoped for. “I was literally following her to the restaurant!” he says. Stopped behind a train, he regrouped and tweaked his plan. “We were both a little nervous at dinner,” remembers Adam, who says it felt like a first date. “I couldn’t lead on I was suspicious, because if I was wrong, I would have felt really stupid,” says Megan, who had started noticing that Adam and her mom were acting a little odd that afternoon. When his phone rang, Adam pretended it was a work emergency and headed out to the porch to finish the call. “As I was on the phone (with our server at the bar), I texted Megan, asking her to come out on the porch,” he says. She arrived, and Adam proposed. Of course, Megan said yes. As Sarah snapped photos, she successfully stayed hidden (in her car! ), and she and Adam surprised Megan with a YouTube video slideshow soon after. The couple plans to use the images in a variety of ways for their wedding, including as save-the-dates, a wedding collage and engagement photos. 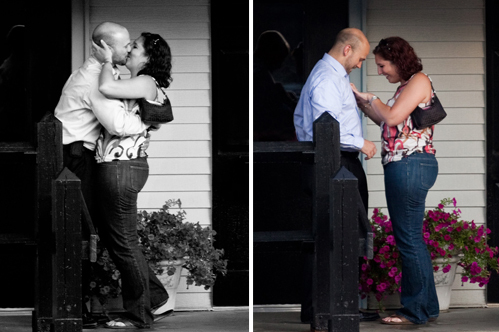 Guys, want to get proposal photos? Sarah offers her best tips for a foolproof shoot. Meet with the photographer before the event to create a game plan. Check that the photographer has a long lens to capture all the action, since he or she should be quite far away. Decide on a location that has ample hiding spots for the photographer—behind trees or bushes, around buildings, through windows or even in a car. Or, choose a busy place, like a skating rink or park, to make it easy for your photographer to blend in with the crowd. Whatever location you choose, make sure the photographer has a clear view. Decide if you want all the images to be profile shots, or if you want to see your bride’s face in the photos. Then, plan accordingly when you’re getting down on one knee.